An open world action-adventure game developed by Insomniac Games. The player assumes the role of the titular Spider-Man who faces the criminal underworld of New York. The gameplay is based on three pillars. The first one is exploration. Spider-Man for PS4 is another game developed by Insomniac Games, creators of many titles – including action platform games Ratchet & Clank, crazy Sunset Overdrive and the series of shooters Resistance. 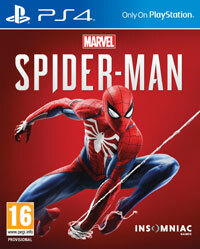 This time the developers decided to create an action adventure third-person perspective game about the legendary superhero Spider-Man. The plot in Spider-Man isn’t a direct adaptation of a comic or a movie. Insomniac Games prepared a completely new story. However, it contains classic elements like the double life of Peter Parker and many well-known characters. Spider-Man for PS4 is a third-person perspective action game that can be compared to the Batman: Arkham series, especially when it comes to combat. The battles are one of the main attractions of the game. The protagonist can use fists, legs, webs and his surroundings. He can, for example, use his web to catch a nearby sand bag and throw it at his opponent or he can throw the enemy into the air and then glue him to a nearby wall. It is also possible to shoot web and set traps. The latter is especially useful during stealth sequences, where instead of participating in direct combat, the player silently moves across the walls and eliminates encountered thugs. The game takes place in New York, which can be freely explored. Spider-Man can easily walk and run across walls. He can also use his webs to quickly swing and move on longer distances. The title is very spectacular not only thanks to the acrobatic skills of Spider-Man, but thanks to QTE sequences as well. During the cinematic scenes the player is watching very impressive actions and he must press specific buttons at right time to succeed. Spider-Man for PS4 takes advantage of platform’s power. Thanks to that the player can observe greatly animated protagonist and his opponents. The New York is looking impressively as well. The title takes advantage of the power of PlayStation 4 Pro, providing higher resolution and better textures on that platform. Game score 8.01 / 10 calculated out of 1129 players' votes. Expectations before the premiere: 9.1 / 10 calculated out of 522 players' votes. The Marvel's Spider-Man Guide for PS4 is a full walkthrough that will help you discover all secrets of this fantastic game. Learn how to unlock all of Spider-Man's suits, check which skills are the best, and get valuable combat hints with moves list.